Lindley Elementary, one of thirty-three elementary schools in the Fort Wayne Community Schools district, is the sole language immersion school in this mid-sized urban school district. What began as a one class per grade level strand with fifty Kindergarten and first grade students has expanded each year. To date it includes almost four hundred of Lindley’s total 450 student enrollment. By the 2005-06 school year, all Lindley students will be part of the immersion program. Due to its success, the program has also expanded to Portage Middle School and Elmhurst High School, secondary schools offering continuous second language learning opportunities. The growth has been positive, but not without challenges. Within the partial Spanish immersion program at Lindley, students receive instruction in Spanish for math, science, and social studies for one-half of the day. Spanish language arts are incorporated into the content instruction. The other half-day’s instruction is in English and is primarily dedicated to the teaching of English language arts—reading, writing, and spelling. Teachers responsible for teaching in the two different languages regularly collaborate to ensure students understand the material in both English and Spanish. This collaboration might include the English teacher reviewing a math lesson in English that had been taught in Spanish or applying common language arts skills and making explicit comparisons between the two languages. When the program began, Lindley had an enrollment of three hundred students with an official capacity of five hundred. Fort Wayne Community Schools was in the process of establishing magnet schools, and magnet programs within neighborhood schools to ensure all educational institutions were racially balanced. The district was also exploring alternative educational program ideas that might draw new families to this under-utilized site. District leaders reviewed research findings on immersion education and learned that students in immersion programs performed better in school as they learned and used a second language. Knowledge about these findings led the district to consider experimenting with a small partial immersion program as a strand within an existing school. Under the guidance and leadership of its first principal, the Spanish immersion program was established at Lindley in the fall of 1992. The program was designed as a one-way foreign language model with the goal of helping native English-speaking students learn Spanish. The majority of the students came from the Lindley neighborhood area, but enrollment was open to anyone within the Fort Wayne Community Schools district. A lottery system was instituted to ensure that racial balance was maintained. Busing was provided for children coming from outside the neighborhood school area. Over the course of the next six years, the elementary program expanded from kindergarten to fifth grade and began to grow from one class per grade level, to two classes per grade level. As principal, Alicia Rodriguez-Bower successfully fought to have the program continue into Portage Middle School, located adjacent to Lindley. In 1998, Bower resigned. Gerald Arthur was appointed principal of Lindley and Jeff King was appointed principal at Portage Middle School. These two principals worked together to make certain that the program would continue to grow. However, several problems needed to be addressed. Immersion students were learning to understand and speak the language, but they also needed to be able to read and write with higher levels of proficiency in Spanish. Another problem was maintaining class size. Students who started in the program in kindergarten or first grade at times moved out of the district. Because the immersion classes cannot allow students to enter the program after first grade unless they are proficient in Spanish, class size frequently dropped to sixteen to eighteen students by fifth grade. To further complicate matters, students who moved into the Lindley area after first grade were placed in the all-English classes, making those classes larger. This created friction among teachers within the building. By the 2000-01 school year, discussion began about how to address the growing popularity of the immersion program as demonstrated by a waiting list of students choosing to enroll in the program at the kindergarten level, and the overcrowding of classes in the all-English program particularly in the upper grades. There were various proposals, but little agreement among parents and staff members. To force a decision in the fall of 2001, the Superintendent insisted that a choice be made between having all students participate in the immersion program and totally disbanding it. After several contentious parent meetings and widespread media coverage, the decision was made to phase out the all-English program over a three-year period and to have all Lindley students participate in the partial immersion program. While this decision angered several very out-spoken parents who opposed the partial immersion program, the vast majority of parents supported the decision and were relieved that a decision had been made. The final decision held that beginning with the 2002-03 academic school year all incoming students in kindergarten and first grade would be part of the partial Spanish immersion program. Beginning with second grade, parents could opt to keep their child in the partial immersion program or to place their child in a “bilingual” classroom where instruction occurred through Spanish but a teacher could use English if the child did not understand a concept. Based on teacher recommendation and parental agreement, students can remain in the “bilingual” class the following year or be placed in the partial immersion class. Also, any students new to Lindley would be placed in the “bilingual” classroom so they could begin to learn the Spanish language. The intent was to allow new students, who were able to learn Spanish quickly, the opportunity to move into the partial immersion classroom the following year. Ten of the eighteen students who completed the second grade “bilingual” class in 2002-03 were moved into the third grade partial immersion class for the 2003-04 school year. In the fall Indiana schools administer the Indiana Statewide Testing for Educational Progress (I-STEP) tests. These standardized tools are in English and provide information on students’ math and language arts achievement in third, sixth, eighth and tenth grades. Achievement data from these tests were used to support the school-wide transition to partial immersion for all and were quite convincing. Over the past six years students within the immersion program consistently outperformed students in the all-English classes in math and did so for five out of the past six years in language arts. 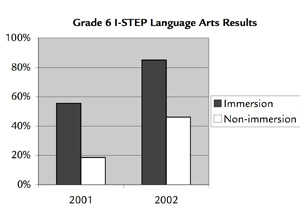 Data collected from earlier years (1997-98 to 2000-01) for the sixth grade I-STEP tests had not looked comparatively at the performance of the immersion students relative to the non-immersion students. However, disaggregated results from the fall testing in 2001 showed that fifty-five percent of the sixth grade immersion students passed the I-STEP language arts test compared to 18.5 percent of the non-immersion students (see grade 6 charts below). The 2002 results indicated that sixth grade immersion students averaged an eighty-five percent passing rate in the English language arts portion of the standardized test compared to forty-six percent for the English only students. Comparative performance in math was also positive for the immersion program. 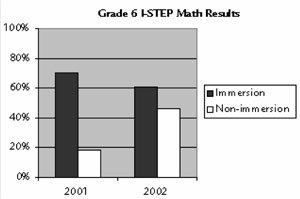 Data from the 2001 math portion of the I-STEP exam found that 70.3 percent of sixth grade immersion students passed I-STEP compared with just 18.5 percent for the non-immersion. In 2002, sixty-one percent of the sixth grade immersion students passed the math portion, versus forty-six percent of the students being schooled through English only. The achievement performance between the all-English program and the immersion program had also not been analyzed by ethnic background until 2001. Results from an additional disaggregated analysis found an overall improvement for both African-American and Hispanic students in both the immersion classes and the all-English classes (see charts on third grade achievement by ethnic background). 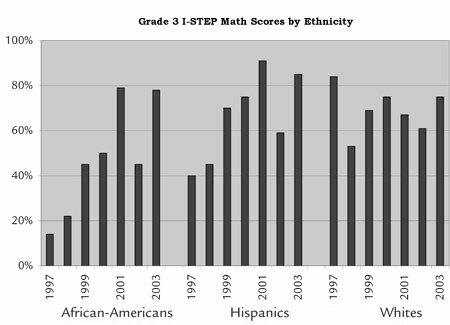 In math, third grade African-American students had shown steady and remarkable improvement over a five-year successive period until 2002, when the scores indicated a marked decrease. 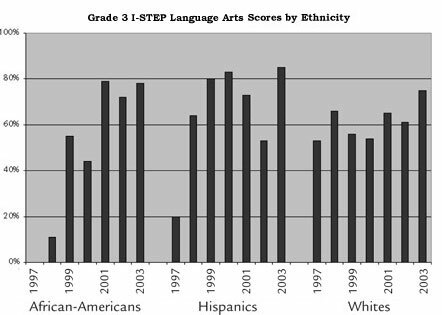 In 2001, seventy-nine percent of African-American students passed the third grade I-STEP test in math and language arts. Scores dropped in 2002 to seventy-two percent passing language arts and only forty-five percent in math. African-American students in the immersion program, however, outperformed those in the all-English class by fifty-seven percent to twenty-five percent. For Hispanic students the data are even more impressive. Overall, from 1997 to 2000 Hispanic third graders in the school went from only twenty percent passing the language arts portion to eighty-three percent. Scores dropped in 2001 to sixty-seven percent and then to fifty percent in 2002. In math, Hispanic students’ scores dropped from ninety-one percent passing to fifty-six percent passing. It is important to note that by 2002 only two Hispanic students remained in the all-English stream; all the rest participated in the immersion program. Neither of these two earned a passing score in language arts or math. The 2003 fall I-STEP results were released by the State of Indiana in December. This was the first year in which all Lindley third graders had received some instruction in Spanish. The overall scores for the school increased by seventeen percent in language arts with seventy-eight percent of all students passing. The math scores jumped by nineteen percent with seventy-eight percent of all students successfully meeting the state expectations. For minority students the data reflect even greater gains. Eighty-five percent of Hispanic students passed both the language and math portion of the tests. African-Americans also did well—with seventy-eight percent of the students passing both the math and language arts tests. While the fluctuation in the scores can be attributed to many possible factors, such as the ability levels of students or the changes in curricular and instructional practices, the overall upward trend in the data indicates that students in the partial immersion program do better on standardized tests than students who have participated in the traditional all-English program. The same results are further corroborated by student achievement results from district-wide quarterly tests as well as teacher evaluations. At Lindley Elementary the partial immersion program has proved itself to be beneficial for all students both academically and socially. From parent, teacher, and administrative perspectives, students recognize and accept cultural differences, language differences, and appreciate that each individual is unique and special. 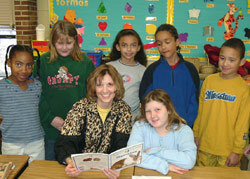 At this time all kindergarten through third grade students have had some instruction in Spanish. All returning third grade students have either been part of the Spanish partial immersion program or were in the “bilingual” class learning through Spanish for the first time last year. We anticipate Lindley test scores will continue to improve for the entire school as all students are provided with the chance to develop their thought processes using two languages rather than just one. The data clearly indicate that the partial immersion program has been successful in helping students from all backgrounds perform better on English-medium standardized tests. Moreover, teachers observe that students in the immersion classrooms are more attentive in the classroom as they must carefully listen and look for visual and other context cues to increase their ability to comprehend the material being taught through Spanish. Teachers remain committed towards continual improvement and have targeted a goal of eighty percent of all students passing the statewide testing within the next two years. Based on the 2003 results, this goal should be achieved.